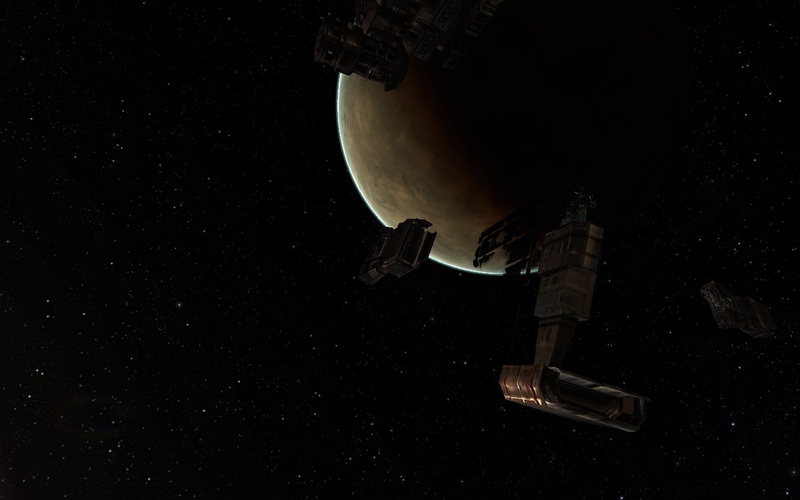 Wreckage from the massive battle disappear into the distance against the backdrop of the Metropolis nebula. The light from the Asghatil gate cuts across the scene like lightning. I’m actually somewhat embarrassed about this week’s entry. I pride myself on my ability to ferret out new sites to discuss as CONCORD catalogs them, especially when they’re part of one of the major turning points in modern New Eden history. To not only have not discussed this site before now, but to be completely unaware of its existence until just a few days ago has admittedly given me a bit of a pause. Not that it is an overwhelmingly huge deal or anything of the sort, but more as a matter of professional pride in knowing that I’ve thoroughly canvassed the various sources I have at my disposal in my ongoing efforts here on EVE Travel. The bow and stern of an Armageddon-class battleship float a few hundred meters apart from each other. It’s just as well that I haven’t discovered this site before now, however, since it mirrors the economic and violent turmoil currently wracking the Cluster. 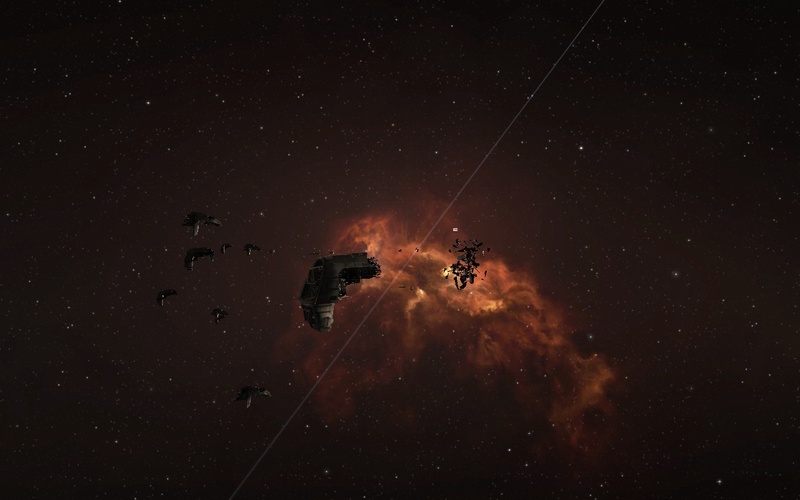 Death and destruction appear to be one of the few true constants in New Eden, and the past week has done more to demonstrate that truth than all of the words I or my fellow writers could ever hope to pass on through mere words. 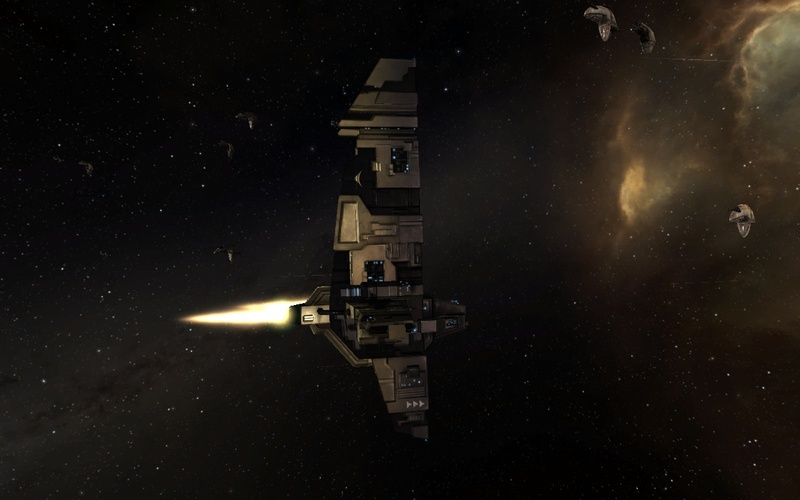 It’s one thing to pass on the terror of battle through either pictures or words; it’s quite another matter to find yourself in the heat of battle, where one wrong move could result in the death of your crewmates and the loss of millions, if not billions of isk. For better or for worse, the terror currently gripping both traders and miners (neither of whom are generally a particularly violent bunch) has acted as a wake-up call that no where can be considered safe, and that you must always be on your guard. It’s a lesson that people need pounded into their heads from time to time. This time around it’s the (normally) hapless industrialists of New Eden that are learning this lesson the hard way, but four years ago, it was the Ammatar Mandate who learned that you can never let your guard down in New Eden. My ship flies through the graveyard as I pay my respects. The few Minmatar wrecks in this graveyard represent all of the casualties that could be inflicted by the hapless Ammatar Fleet against the Elder armada that swept through the Mandate worlds. Offering sanctuary to those who embraced their Nefantar heritage, the invaders were swift to execute those interfered with their mission to liberate the last remaining survivors of the Starkmanir Tribe. Rumor has it that many Ammatar Fleet captains simply turned their ships away—not from fear of the marauders, but out of respect, admiration, and above all else, a guilty conscience. Beams and girders from this Apocalypse-class ship are easily visible, showing the massive stress this hull was subject to. The battlefield sits about 200 kilometers off the stargate into Asghatil, in a gentle arc facing the sun. The vast majority of the arc glints in the sunlight: the golden hulls of the broken Ammatar ships still glint like new if you only glance at them. Indeed, my very first impression upon looking at a number of the ships was that the battle had only recently ended. Even after four years, some ships still had active reactors or capacitors, spitting off intermittent energy into the vastness of space. The majority of the wrecks were Armageddon and Apocalypse-class battleships, but that was only because any smaller ships had been pounded beyond any hope of recognition. The ships that did survive more or less intact still showed signs of immense damage. A number of the Armageddon class ships were cracked in half along the spine, like some child would do playing with a twig. The fact that these “twigs” were multi-million ton battleships shows something of the awesome firepower the Elders had brought to bear on this mission. The lower sail of a Tempest-class ship is visible to the right, as Jarizza XII hangs in the distance. That is not to say, of course, that the Elders didn’t take their own casualties. 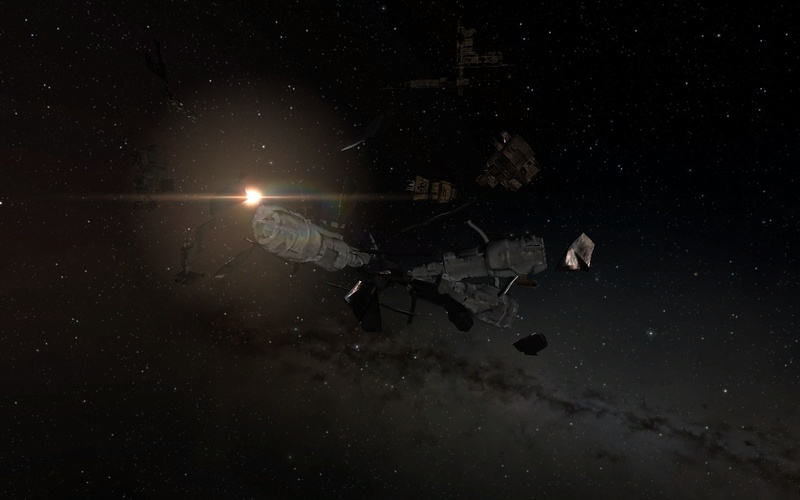 Closer to the gate, a small collection of Minmatar wrecks sat, still gently tumbling through space. Of the recognizable wrecks, most of them seemed to be from Tempest-class ships. 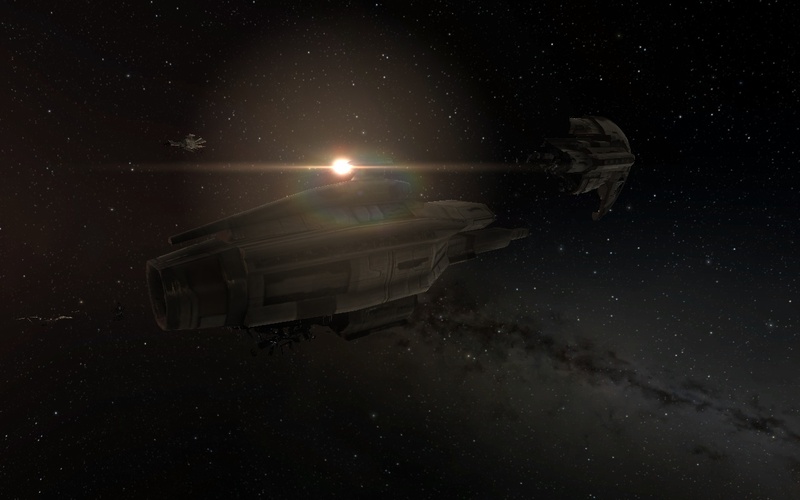 It’s astonishing to think that these battleships must have acted as the outer perimeter of the fleet, since all accounts show that the bulk of the Elder forces were capital ships (seemingly setting the stage for current null sec capsuleer doctrine). None of the behemoths were brought down (those losses wouldn’t happen until the Elders pushed through to Sarum Prime), only the outer perimeter forces suffered any damage. Perhaps most surprisingly, a few Tempest sails actually managed to survive, despite their apparent fragility. They added a somewhat ghostly backdrop to an already ghostly visage on the main battlefield. The mangled remains of this Armageddon-class vessel suggest that at least the crew probably died quickly. I spent quite a while in Jarizza, paying my respects to the dead. This, after all, was the vanguard site of the Elder Invasion. The Elders managed to obtain almost complete surprise on the Jarizza forces, and they had almost no hope whatsoever. And, in a way, it also gave me a certain peace with the current situation. Reflecting on this past massacre also gave me a bit of closure for the current spasms that are wracking through New Eden. 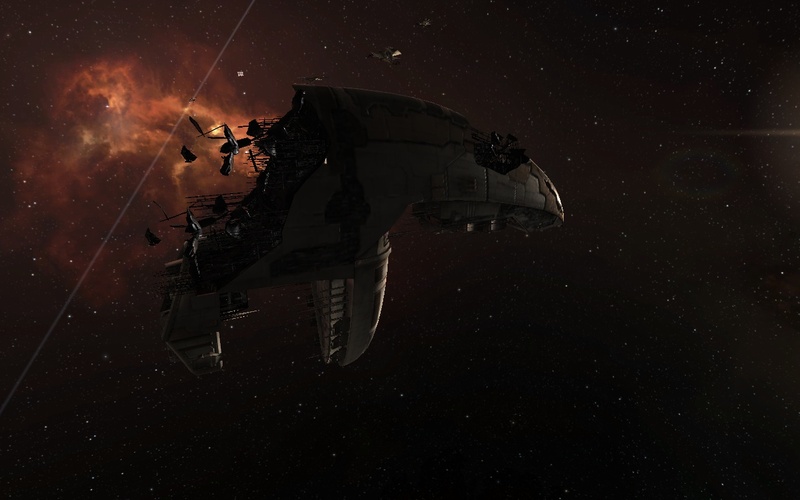 After all, if events like the current Jita incursion and the so-called Hulkageddon prove that death and destruction are one of the few things that we can count on in New Eden, it also reinforces the most optimistic message that I ca think of: Life goes on. …And hopefully next time it won’t take me 2 years to discover it. Potential Hazards: If you’re below a -3 in security status, or -5 standing with the Ammatar, you’ll have to deal with some rather unpleasant policemen. This entry was posted on April 29, 2012 by mark726. It was filed under Hi Sec Sights and was tagged with Derelik. Visited today, no sign of the Armageddon, just small wrecks, weird. 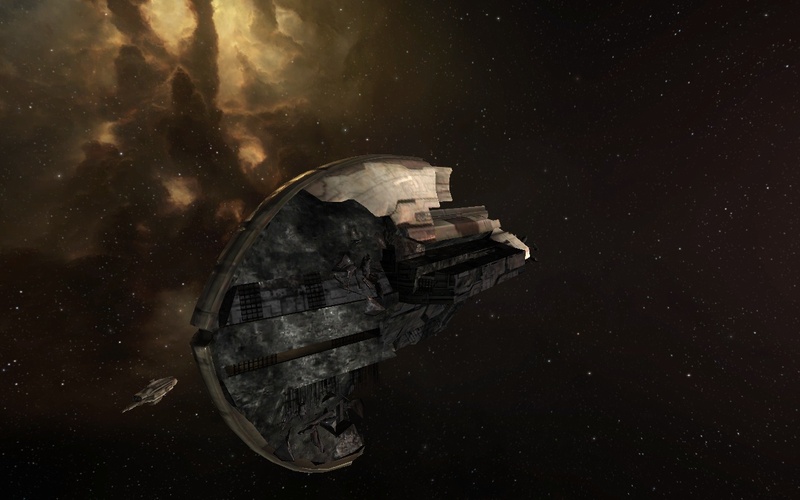 I think as CCP has been updating some of the textures, they’ve been dropping some of the old wrecks (the battlegrounds in Luminaire also show a lack of wreckage we used to see). I haven’t decided how I want to handle that in here yet, but thanks for the update!